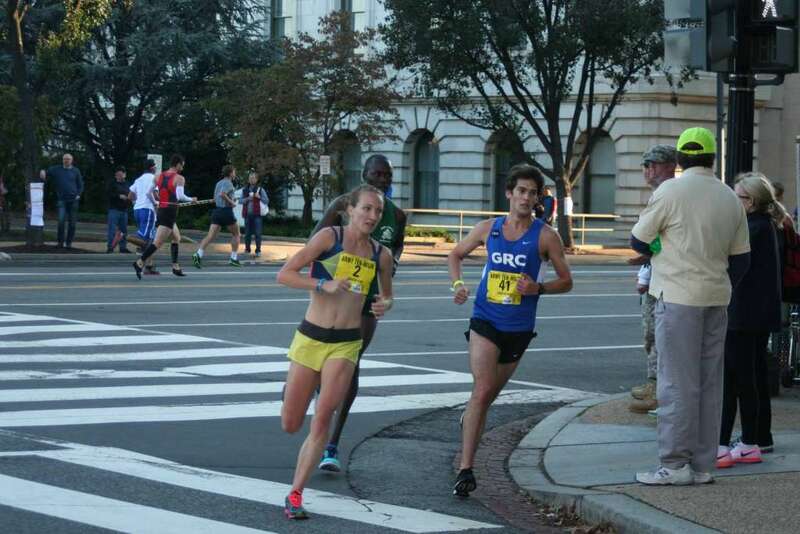 Around D.C., she’s known as the three-time Army Ten-Miler winner. Nationally, she’s the 1500 meter runner who has thrived at the USA Track and Field championships two of the last three years, finishing third on June 28. [button-red url=”http://www.flotrack.org/coverage/252353-Lignano-Meeting-International-2015/video/776443-Womens-1500-Kerri-Gallagher-hits-IAAF-A-Standard-40356#.VZ1djvlVhBf” target=”_self” position=”left”] Watch the race[/button-red]Now, she’s ready to make her national team debut at the IAAF championships this August, after she blew by the qualifying mark July 7 in Italy. She ran 4:03.65 at the Meeting Internazionale di Atletica Leggera in Lignano, recording a more-than five-second PR, winning her race and breaking the meet record. She is on a three-race trip through Europe that started with the express purpose of achieving qualifying time — 4:06.5, but with that accomplished, she can go into races in Belgium with less urgency. In Lignano, she catapulted herself up the U.S. women’s standings for the year, ending up fifth at the end of the day July 7 from 15th before the race. In the process, she beat Alexa Efraimson, number four on the list and the junior U.S. recordholder at 1500 m, head-to-head. She also went from the 53rd fastest 1500 runner worldwide this year to 22nd. “I thought 4:06 was very reasonable and knew I could do it. I didn’t expect much faster than 4:05, to be honest,” she wrote in an email the day after the race. The race played out to her plan for running a fast time, following a rabbit through a 65 second first lap and 2:10 800 meter split. She led the third lap in 65 and held off Efraimson and Violah Lagat in the last half lap. A varied approach to her racing this year — in which she has faced all sorts of conditions and tactics — gave her every reason to think she could squeeze another 13 meters into that time by the Aug. 9 deadline. Her last two seasons have seen her bring more deliberation and purpose to her races, learn a few hard lessons and continue her steady improvement. A hot May in the D.C. area may well have helped Gallagher, an Arlington resident and assistant coach at American University who is sponsored by Oiselle. 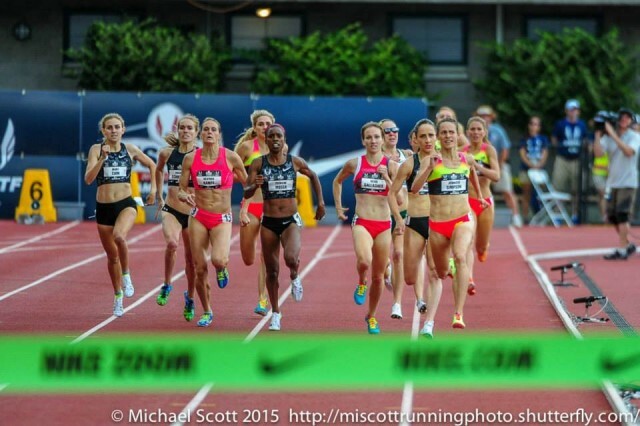 The 90+ degree temperature primed her for racing in the Oregon heat wave, when the 98-degree high on June 26 set a record in Eugene while she raced her preliminary heat. Temperatures in Lignano were in the mid 80s around 9:30 Tuesday evening. That confidence wouldn’t be shaken by a slow start to the final that saw her trail in last place for more than half of the race. A slow pace early would equalize the advantage the eight women with sub-4:05 times this season — the deepest final in history — would have. She knew from experience, stumbling on the inside rail in a Canadian meet and just missing a collision that took down sub-4 1500m runner Shannon Rowbury and Heather Wilson at the Oxy Invitational in California. And sure enough, Gabe Grunwald fell off the track at 900 meters. When Gallagher swung outside and took the lead briefly from 2011 world champion Jenny Simpson, commentators first neglected to mention her move, then called her “Kelly” Gallagher, clearly taken aback by her move. Georgetown alumna Treniere Moser was on her heels, but as Simpson and Rowbury pulled away from the pack firmly into the top two spots, Gallagher did the same to third for a .27 edge over Lauren Johnson, with another Georgetown alumna, Rachel Schneider, finishing fifth, .01 second behind Johnson’s sprawling dive to the finish line. Simpson’s Diamond League victory last year gives her a bye to the IAAF meet, and allows four American women to compete. 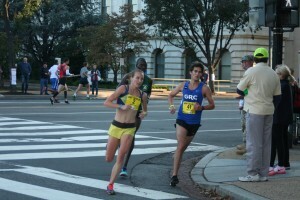 Schneider, who is also racing in Europe, ended up pacing the race in which Johnson hit the standard, deferring her chance at the national team for the year. That Gallagher came into the USATF final with just the 15th fastest U.S. 1500 time this year was a symptom of the races she had been in, rather than a reason to cast doubt on her chances. And she saw a lot of different kinds of races this year — being outmatched indoors, planning to kick, fighting chilly rain, running alone in the front, and attempting to recover from nearly falling over other athletes. Each fortified her skill in a different phase of the race. In addition to the cumulative strength gains she has made over the last four years, her mental approach has settled on one suited for her newfound endurance and thanks to advice from her coach, Matt Centrowitz. Centrowitz said the longer distance training in the fall has been a big part of that. Consistently good health has also played a part in this season’s successes. A stress fracture hobbled her in 2014, a year, perhaps not coincidentally, in which she did not make the USATF 1500 meter final. “She’s been healthy for 18 months, and when you have that momentum, its easy to keep things going and improve,” Centrowitz said. She’s also more comfortable taking chances, and it paid off at the Penn Relays. After two lackluster races in which she went out conservatively, Centrowitz encouraged her to be more aggressive, and it paid off, with her first win in at that meet’s Olympic development mile. Though Centrowitz raced internationally during his career as an Olympian at 1500 and 5000 meters in the late 70s and early 80s, he doesn’t see much that he can offer her as she goes to Europe for the first time in her life on an important business trip. Gallagher grew up in Queens before running at Fordham University in the Bronx. After a tepid race at the 2011 NCAA championships, she figured her serious racing career was over. Ninety minute-long track practices made way for commutes that long each way to a job in financial services in Manhattan. After a few weeks, she talked to her Bishop Kearny high school track coach, John Lovett, and mentioned the track-sized gap in her life. Centrowitz, a friend of Lovett’s, found a place for her on the Pacers-New Balance training group and it was goodbye Big Apple, hello nation’s capital. Gallagher’s introduction to summertime in Washington in 2011 was not easy and breezy. The heat, humidity and the miles were staggering, but she found herself adjusting to her new home pretty well. Living with Centrowitz’s daughter, Lauren, helped, Centrowitz said, because she helped Gallagher adjust mentally and emotionally. Gallagher acquitted herself of the Washington area’s running amenities quickly, though she now affiliates herself with the New York Athletic Club. Trails within a few minutes’ trot from American’s campus in Tenleytown and Roosevelt Island near her home in Rossyln beat driving to Van Cortlandt Park in the Bronx. She got her introduction to running from her mother, Patricia. Neither she nor her father John ran, but they saw some dissatisfaction from her when she was on the JV basketball team, keeping the bench nice and safe for when her teammates came off the floor. “I don’t know where she came up with the idea, but I’m glad she did,” Gallagher said. Now running is a family pastime, with five of her nine siblings serious about running. Mary ran for Saint Francis College in New York, Conor and Liam run at Malloy College in New York and Jackie and Tess run at Bishop Kearny. Despite not thinking much of running around in circles, as she regarded track, she was a hit in the middle distances, and became seriously interested in running in 11th grade. Lovett told her she can run in college, somehow. Fordham was interested, and she found her place on the 4×800 meter relay, safely ensconced in the team. As in high school, her enthusiasm jumped during her junior year, when she started focusing on the 1500 meters. Her times had been dropping steadily, 5:03 as a freshman, hitting 4:48, 4:36, 4:20 each successive year. She ran cross country, too, but barely approached the girls she would race to the finish line on the track. She loves the 1500 because it’s half speed and half strength. [button-red url=”https://itunes.apple.com/us/podcast/pacers-running-podcast/id991180280?mt=2&ign-mpt=uo%3D4#” target=”_self” position=”left”] Kerri on “Pace the Nation” [/button-red]Her track runner’s offseason got more serious in Washington. 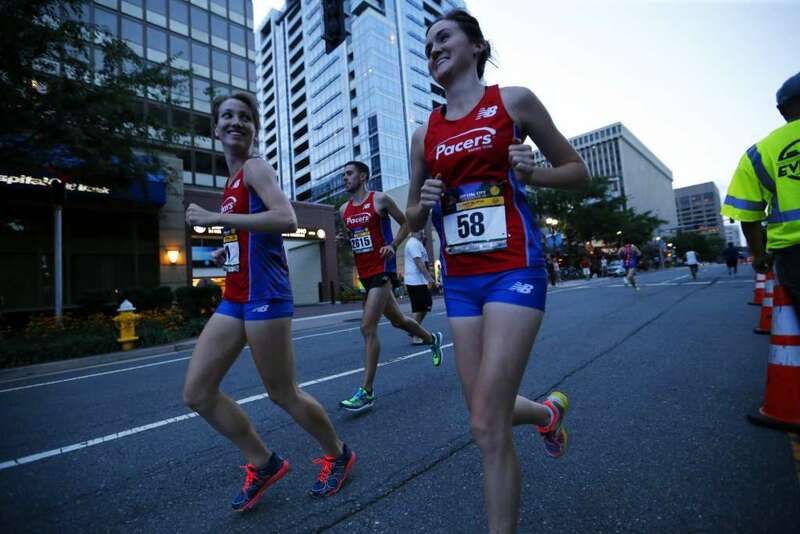 Centrowitz had her run in races much longer than her college cross country jaunts, and her victory and steadily-dropping time at the Army Ten-Miler is becoming a fall tradition after three years. Her first winning effort averaged faster than her college 5k PR, and her time for her off-distance specialty has gone down to 54:50 from her debut time of 59:47. What she needed, Centrowitz said in 2013, was to learn to change her outlook to benefit her training. In 2015, he said that she had mastered that, thanks to some mentoring by former training partners, including his daughter Lauren and former American standout Erin Koch. “When they graduated out of the program, she stepped up and showed what she could do, she learned how to assert herself in workouts and races,” he said. Now she gets some company in workouts from Jesse Carlin, an 800 meter specialist training under Centrowitz. 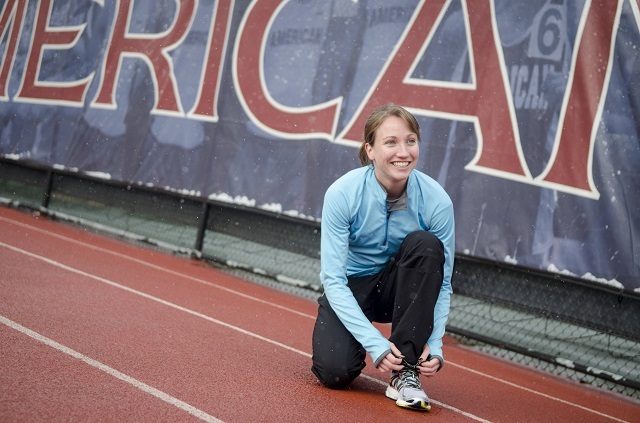 Julie Culley, a 2012 Olympian in the 5000 meters, has also joined workouts, when healthy. Gallagher leans as much on Centrowitz’s mastery of the ancillary aspects of competitive running as the mechanics. “Knowing he has been there before with things like your managing expectations has been really important,” she said. As she prepares for races in Belgium July 11 and 18, she has a cadre of American athletes with whom to spend her time while in Europe. On July 17, Gallagher got to be a part of a historic race in Monaco, in which Ethiopian Genzebe Dibaba ran 3:50.07 to break the world record and Rowbury ran 3:56.29 for the American record. Gallagher finished 11th in 4:06.07.